ATN NVMPAN1440 NVM14-4 Night Vision Monocular FREE SHIPPING! The NVM14-4 Night Vision Monocular from ATN is a powerful optic device for low-light observation--ideal for surveillance operations, nighttime hunting, searching dark buildings and other tactical conditions where low-light visibility is critical. Featuring a compact, rugged design and waterproof construction, the NVM14-14 is capable of handling the toughest tactical missions and roughest field environments. Versatile mounting options allow for securement to the head or helmet for complete hands-free operation. No fumbling with tricky equipment or handling cumbersome flashlights, simply mount and go. An internal, automatic brightness regulator maximizes use of all ambient light to ensure vivid image clarity. For situations where no light is available, a built-in infrared illuminator provides ample fill light for total night vision viewing. An automatic shutoff feature protects users' eyes by deactivating the device if bright lights are present for more than ten seconds. 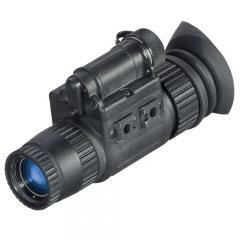 ©2002-2019 CopsPlus.com: ATN NVMPAN1440 NVM14-4 Night Vision Monocular FREE SHIPPING!